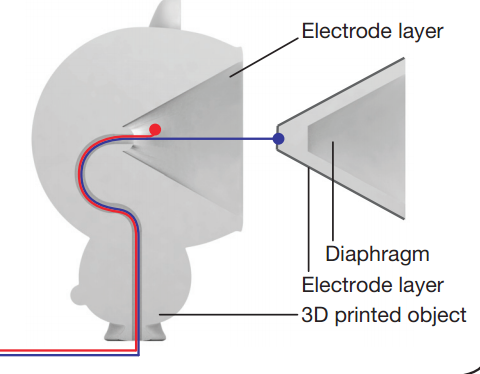 By adapting a little-used speaker technology developed in the 1930s to 3D printing, a Disney Research (s dis) team has been able to create highly interactive speakers in funky shapes. Examples of 3D printed speaker designs. Photo courtesy of Disney Research Pittsburgh. The team believes the speakers would be a good fit for toys and games. Their audio is not affected by being touched or held. They also can emit sound at frequencies too high for the human ear, which could allow gaming systems to track their location for interactive play. The internal structure of a 3D printed speaker. Photo courtesy of Disney Research Pittsburgh. Most speakers today contain two magnets, one of which vibrates to produce sound, which is then amplified by a cone of flexible material. The Disney speakers, which are based on electrostatic speaker technology, are composed of a thin membrane sandwiched between two electrically conductive surfaces. When the conductive surfaces are exposed to an audio signal, the air between them and the membrane become charged, deforming the membrane. This produces sound. This may sound complex, but it is actually much easier to build an electrostatic speaker than the speakers more commonly used today. The researchers created the conductive surfaces by manually spraying a conductive paint on the speakers. But 3D printers that print both plastic and conductive materials are becoming more common, which means in the future the whole process could be automated. The researchers test printed the speakers in shapes like a duck and a spiral. They are able to emit sound from any part of their surface. While they are not able to emit bass tones, their range includes high frequency sounds like the human voice.